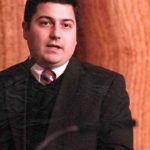 On January 17, 2018, State Senator Juan Murante introduced three voter suppression bills including a voter ID bill, a bill that would weaken provisional ballots, and legislation that would force county election officials to use a database that could lead to the removal of eligible voters who legally voted for years from state voter files. Murante is running for state treasurer in 2018. John Murante is running for state treasurer in 2018.